QuickBooks Enterprise is designed specifically for businesses managing more complexity. It’s Intuit’s most flexible version of QuickBooks, packed with additional features and extra flexibility your growing business needs in accounting software. End-to-end workflows empower QuickBooks Enterprise users to file taxes, pay employees, inventory, and reporting from one resource. Over 6X the capacity of other QuickBooks products – The ability to add up to one million names gives you the power to track hundreds of thousands of customers, vendors, and items. 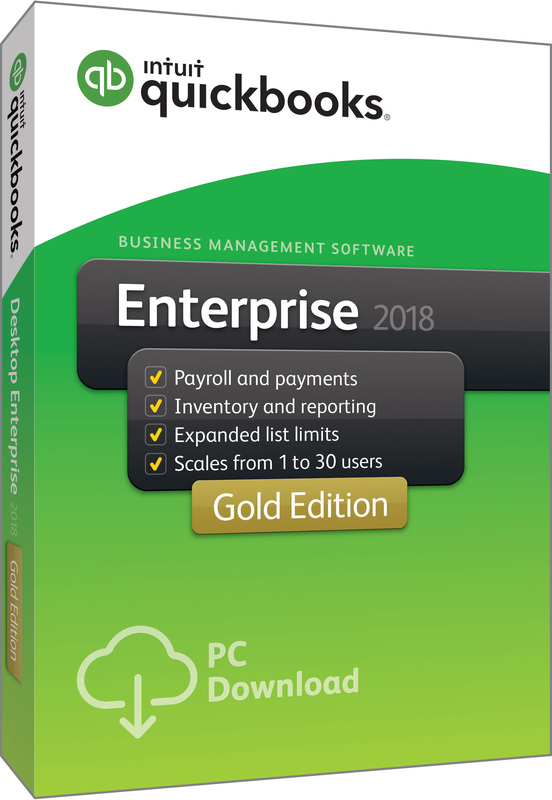 Flexible, grows with your business – Set up 1 to 30 users in no time.QuickBooks Enterprise delivers the functionality you need to manage your accounting, payroll, payments, inventory, and more. A familiar QuickBooks look-and-feel – Whether you’re new to business management software or already a QuickBooks customer, you’ll find it easy to manage your accounting and business needs. Now, discover untapped insights into how your business is running with the all-new Advanced Reporting feature in QuickBooks Enterprise. Access all your QuickBooks data to build any report you need. With enhanced searching and filtering, and much more, it’s Intuit’s most customizable QuickBooks reporting tool yet. Intuit has integrated an advanced inventory management system directly into QuickBooks Enterprise – with the same user interface. There is no need for a separate inventory management system, software, or data integration. All of your business data is located in one central place so that you can easily manage your accounting data, inventory systems, job costing reports, and more. The QuickBooks Enterprise Solutions Full Service Plan now includes preferred rates for QuickBooks Payments—on top of the exclusive access to US-based support, upgrades, training tools, and much more. We think you’ll be delighted with the end-to-end integration that QuickBooks Payments and QuickBooks Enterprise Solutions provides. With a $0 monthly fee and no long term contract, why not give it a try? Electronic Data Interchange (EDI) is the computer-to-computer exchange of business documents in a standard format. Far faster and more accurate than paper forms, EDI is indispensable in today’s accelerating and complex supply chains. This is why major retailers, manufacturers and wholesalers almost universally mandate that their suppliers use EDI. TrueCommerce EDI, along with one trading partner, is included with QuickBooks Enterprise at NO charge! Monthly network fees apply. Available as an add-on for only $49 / month for unlimited users, our online business analytics tool will give you additional insight into your business. Unlock the details in QuickBooks Enterprise so you don’t have to enter any numbers or run any reports. It’s all automatic with the click of a button. The Silver Edition is a great way to get started with Enterprise. It includes QuickBooks Enterprise software, Full Service Plan and Advanced Reporting. Gold Edition has all of the features of the Silver Edition plus Enhanced Payroll so that you can easily pay employees, pay and file taxes. All of the features of the Gold Edition plus Advanced Inventory & Advanced Pricing to help you manage complex inventory and pricing processes.